Whole Grains: Are They Healthier Than the Alternative? Whole Grains: Are They Healthier Than the Alternative? Whole Grains: Are They Healthier Than the Alternative? Whole or....not. Should you eat grains? You’ve undoubtedly heard that refined wheat and other processed foods are unhealthy. But what about the “good kind of wheat,” the kind found in whole grains? What are the benefits of whole grains compared with their sinister relatives…refined grains? Since the food pyramid was first developed in the 1970’s, it has emphasized carbohydrates while the American public has gotten consistently more and more obese. In January of this year, The US government released the most recent revisions to its dietary guidelines. The USDA Food Pyramid, now known as MyPyramid (it now encourages personalized recommendations that adjust for activity level, gender, and other variables), reflects the government's recommendations for the consumption of grains and other foods. The recommendations for grains now include division into 2 subgroups, whole grains and refined grains. Guidelines include eating 6 servings of grains per day with half of those servings coming from the so-called “whole” grain group. Their guidelines define a serving as, 1 slice of bread, 1 cup of ready-to-eat cereal, or ½ cup of cooked rice, cooked pasta, or cooked cereal. These examples can be considered a one ounce equivalent or, one serving from the grains group-and we are told to eat 6 servings a day? Whole grains contain the entire grain kernel-the bran, endosperm, and germ. Examples include: whole-wheat flour, bulgur (cracked wheat), oatmeal, whole cornmeal and brown rice. Refined grains have been milled, a process that removes the bran and germ. This is done to give grains a (re)finer texture and improve their shelf life. 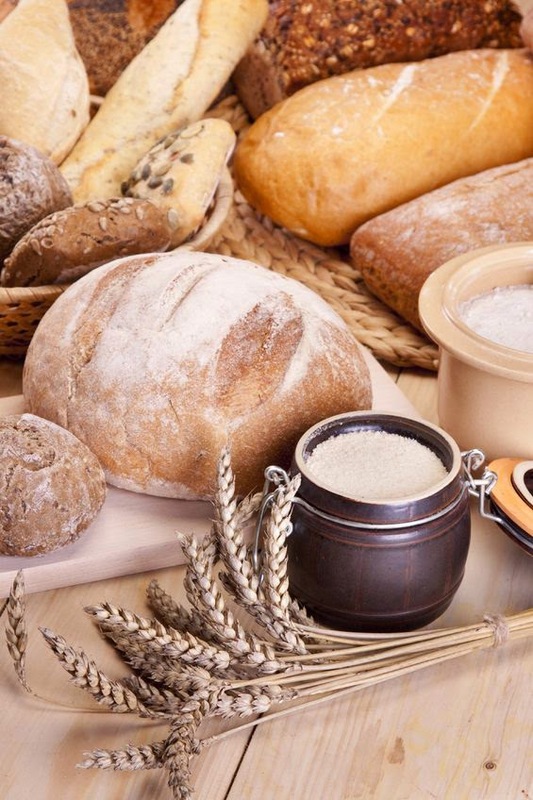 Some examples of refined grain products are: white flour, de-germed cornmeal, white bread and white rice. These recommendations are significant because even though a majority of nutrition professionals recommend limiting grains altogether (including whole grains), the government’s guidelines are likely based on political compromises made between the powerful lobbyists of agricultural producers with conflicting economic interests. I.e. red meat recommendations based on beef producer’s recommendations or egg recommendations brought to you by The American Egg Producer’s Lobby. There are also lobbyists for grain industries. Many believe the USDA’s Food Pyramid is really the lobbyist's Food Pyramid. Does this mean that even whole grains are “bad” and if so, just how bad? While it isn’t necessary or realistic to use the word “never” in regard to food (transfat and high fructose corn syrup being the exceptions), whole grains, unfortunately, are not much healthier than processed grains because neither can be eaten without some level of processing. However, there are degrees. White flour, bread, pasta, and rice are almost completely stripped of their nutrients and whole grain foods are only slightly less processed. The kernel is the seed from which the wheat plant grows. Each tiny seed contains three parts that are separated during the milling process to produce flour. The refining process removes the nutrient-rich bran and germ portions of the wheat leaving primarily empty, processed starch (flour). Most of the fiber is removed and the processed flour is often bleached to improve its texture and appearance. Just beneath the bran lies the endosperm, the starchy inner core of the kernel. It is the main source of white flour and contains the greatest amount of protein, carbohydrates and iron, as well as some soluble fiber. The innermost layer is the germ. It contains vitamins, essential fats, and anti-oxidants. Bran, the fiber component, also contains a protein-rich outer protective layer. Bleached flour is then “enriched” (meaning nutrients are added back in-mostly a few isolated B vitamins and iron) in an attempt to replace what was lost in the refining process. Fiber is never added back in making the high-fiber claims of food companies largely unfounded. There is little more than a gram or two difference in fiber content between bread made with whole grain flour and bread made with white flour yet the glycemic index (which measures how fast a food is likely to raise your blood sugar) of both types of grain is very close-and high. The same goes for the fiber content in whole wheat pasta and brown rice. These more fibrous foods would be thought to be significantly higher in fiber but they are still processed to an extent that much of their fiber has been processed out. Since fiber intake is an important part of blood sugar control, the processing of wheat diminishes the fiber content of grains-even whole grains. Thought to ponder: human beings can't exist without protein or fat. So makes one wonder then, why the U.S. Food Guide Pyramid emphasized carbohydrates. Fitness expert and strength coach Jini Cicero, CSCS, teaches intermediate exercisers how to blast through plateaus to create incredible transformations. Are you ready to take your fitness to a whole new level? Find out now! www.Jinifit.com. © 2011 Jinifit, Inc.